Hint: You can browse all help topics and articles by categories. Add music albums using their titles. Scan barcodes of your albums into the program and let it download necessary information. Barcodes can be entered using a webcam, a barcode scanner, or manually. Scan your collection of music files and let the program extract information directly from the files or download it from the internet. Create printer-friendly reports with existing templates or easily add your own templates using the report builder. Print any page that you see. Play music albums with the built-in or with an external player. Download information about artists from the internet: photos, biographies, complete discographies. Use different online music databases to improve your experience. Adjust the amount of information to be downloaded. Export your collection as an illustrated music catalog for Dune HD media players. Show statistics for your music collection. Search your music database for entries that match certain criteria. Quickly find albums or artists with the "Quick search" field. Create various custom lists on the "Collection" tab of the program. Use the loan manager to remember whom you give your Audio CDs or DVDs. Apply filters to the list of music albums. Edit information for individual albums and artists, as well as for groups of albums. Create new sorting possibilities with custom fields for artists. Back up your music database to prevent any data losses. Update scripts to ensure that the most recent and complete information is downloaded. Use Musicnizer in your language. Multilingual interface and online music databases in a number of languages are supported! Fully compatible with Windows 8.1, Windows 8, Windows 7, Windows Vista, Windows XP (32-bit and 64-bit versions for each). Don't know where to start? Visit our "Quick start" page! Musicnizer stands for music organizer. 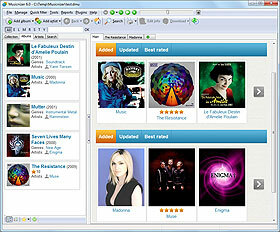 As its name suggests, the program was created to help organizing music collections of any size. It will be equally useful for people that keep their records on Audio CDs, on vinyl LPs, on audio cassettes, on Audio DVDs, as audio files etc. Musicnizer can keep track of any audio format and will promptly tell you where exactly your favorite album is located (maybe you gave it your friend awhile ago? ), how many albums of your favorite artist your have, what albums you'd like to add to your collection, and much more. If you keep your music collection on a hard drive in some digital format (like MP3, FLAC, APE), Musicnizer will scan your music files, creating a catalog with a clear structure. It will download album covers, reviews, genres, and other information from the internet. For artists, Musicnizer can download photos, biographies, complete discographies, interesting facts. Use the program to explore the world of music, learn more about your favorite artists, get missing albums. Musicnizer will create a colorful catalog of your music and forever change the way you interact with your collection. The program is capable of playing music in most popular audio formats (including MP3, WAV, OGG Vorbis, APE, WMA, FLAC), but it is also possible to associate files with your favorite audio player. Use filters and the powerful search engine to find the thing you are looking for. The built-in loan manager will notify you if some CD is still to be recovered from a friend. The location and disc number fields tell where exactly a particular CD or LP can be found, so you do not need to look through your entire music library. Among other things, the program can create customizable printer-friendly reports. Comprehensive statistics of your music collection is also available. Organize your music with Musicnizer, it's fun!